"Canada's best student experience at a research-intensive university": this bold statement reflects a transformation that occurred over the past 20 years, a transformation that has made Western the envy of other leading universities. For 11 consecutive years in the Globe and Mail's survey of student satisfaction, thousands of students graded Western at the top of its class on a wide range of measures: from the high quality of our teaching, to the outstanding facilities and residence experience, to overall campus atmosphere and student satisfaction. What accounts for Western's edge in this category? We believe the most distinguishing element of Western's unique identity is our unwavering commitment to outstanding student engagement across the spectrum of the university student experience: from the classroom, to the libraries, to residences, to athletics and recreation, to co-curricular clubs and student involvement in campus leadership. The success of this formula is evident from entrance to graduation. Our first-year cohort now arrives at Western with grades well above the Ontario average and amongst the highest entering averages in Canada. Once enrolled, our entering students stay to complete their degrees at Western: their retention and graduation rates consistently rank among the highest in the country. And they graduate into success: employment rates for Western's undergraduate class of 2010 six months after graduation averaged 87.2%, rising to 93.9% two years after graduation. The well-rounded education students receive at Western propels our graduates into diverse leadership roles across the public and private sectors. We take pride in the fact that more Western alumni have been named among Canada's "Top 40 Under 40" than graduates of any other university in the country. In addition to the dedication of its faculty, staff, students, alumni, and community partners, Western's successes have also been significantly influenced and guided by its strategic plans, which date back to the early 1980s. More recently, Leadership in Learning (1995), Making Choices: Western's Commitments as a Research-Intensive University (2001), and Engaging the Future (2007) have articulated institutional aspirations and strategic priorities. Each edition has guided the development of academic plans in our Faculties, Departments and Schools, and has framed the operational plans in all of our support units. For more than 20 years, these plans have provided decision touchstones in the annual budgeting process, and collectively they have shaped Western's overarching direction and evolution. 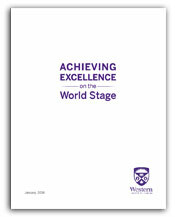 The 2014 edition of Western's Strategic Plan - Achieving Excellence on the World Stage - builds upon the momentum of preceding Plans. It revisits and rises to President Hall's challenge from 1956, and aims for nothing less than transforming Western from being "Canada's best" into being a truly global university. The Plan's title signals Western's determination to raise its profile among globally pre-eminent universities. By raising our University's national reputation and international profile, we will: (1) be able to recruit and retain the world's brightest students, faculty and staff; (2) enhance the value of a Western degree for current and future graduates; and (3) enable our scholars and researchers, students, faculty and alumni alike, to grapple with the important questions of our time to seek solutions to our world's outstanding problems. 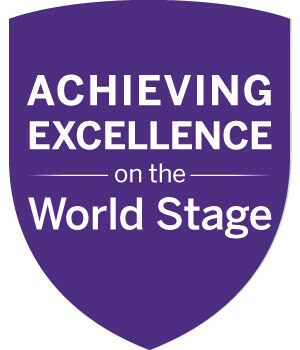 Although a plan for today, Achieving Excellence on the World Stage is guided by an old and powerful idea: Western's motto, Veritas et Utilitas - which signifies the University's dedication to "truth and usefulness" - remains the animating spirit of our shared ambition to seek always the betterment of the human condition.